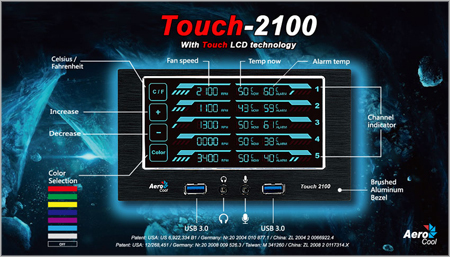 Touch-2100 is a manually operated fan controller that easily controls and monitors five temperatures and fan speeds at a glance. You can freely increase or decrease fan speed of a particular fan according to the temperature the heat sensors of the corresponding channel detects. An alarm temperature can be set to a particular channel in order to carefully monitor the increase of temperature of particular component/s. 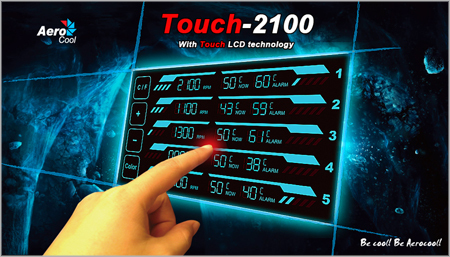 Once the detected temperature exceeds the alarm temperature, the Touch-2100 will automatically increase to the max. speed of that fan of the corresponding temperature channel in an effort to cool the temperature down below the alarm temperature and thus ensuring the well-being of components. As soon as the temperature is dropped below the alarm temperature, the fan speed will automatically return to the previous manually set fan speed. Touch-2100 safe guards your PC components around the clock and throughout the year! Support up to maximum 25W per fan channel. 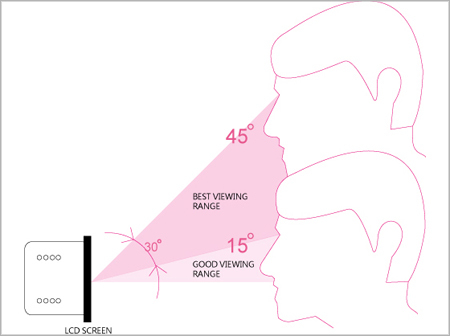 7 LCD backlight colors selection or turn off backlight completely. Monitors and Controls 5 sets of temperature and fan speed individually. Switch between Celsius and Fahrenheit. 2 x USB3.0 ,Mic & Headphone. When 25W is exceeded power will be shut off due to auto protect. This controller put the finishing touches on my recent pc purchase. I have a Corsair 230T case, and installed 6 red LED 120mm fans. I can control the 2 front, 2 top and 1 bottom with this controller. The rear exhaust runs on the motherboard. 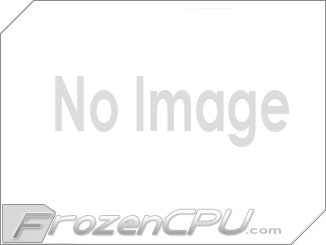 This device allows me to keep this overclocked processor , video card and 2 harddrives cool and quiet. What I really like is the fact none of my LEDS dim when adjusting the fan rpms. If you know how to set up an air cooled system correctly, this is the product for you. 2 extra USB ports and audio jacks on the front are a nice addition also. For the one bad review about this product dont pay any attention to it. You cant hook more than one fan on the channels even if they are enough watts. This controller recognizes your fans type, and max rated rpm if they are not exactly the same brand, size, rpm, bearing type. You will have issues. This is the first AeroCool Product I have bought and I have to say I''m pleased If you want a great controller that looks cool too then this is the one for you. I have five fans hooked to it on there own channels. Three 200mm, one 140mm, and one 120mm. The temp sensors are a great addition. Although with the thermaltake case and push pull CPU and full VGA block Liquid cool system I never run over 45c on either my CPU or vga, the temp alarms are a great feature. There are a few cons, for one you can''t Overclock the fans more then there max rpm. Which I guess is a safety feature. But, also they need to add some sys fan to Molex connectors. I had to buy some. They are very cheap so, don''t be an idiot and cut and splice like the bad review guy. He''s not so bright. Also if you have no idea on what you are doing on pc''s don''t pretend too. Leave it to the pro''s. It works but I am not happy with it at all. I am not sure if it really supports 25w per channel. I run 3x Corsair 140 Static fans per channel which have super low fixed RPM @ 1100 and causing this unit to become unstable, and the unit beeps every 10 mins for a few seconds. I also wired to two 2x fans (same Corsair AF140 Static)and it does become more stable but still beeps randomly like once per hour. I actually grab another unit to test if I am experience a defective unit, but the result comes out about the same. 25w suppose to support 4x 100mm fans without sweat if only running at 1000 rpm range, but this Touch-2100 apparently does not shine light on me. Here are some pros and cons in my opinion. Pros -one screen shows all fan operations and temperatures -changing appearance color to match the case -has alarm function to watch temp for us -touch screen and adjustment is very easy -good to have extra USB and audio ports for some people Cons: -its internal fan port connector is not common (mini 3 pin Molex) so must use its provided adapters -additional USB and audio ports are totally garbage to me and most of PC DIY people, especially the additional cables can be hard to manage. -NO WAY TO DISABLE BEEPING (unless physically remove the speaker from its circuit board) -No way to turn off the LCD screen completely. The "Color" button will remain as minimum stealth mode. -It always beeps for 20-30 seconds when power on the computer.. Its my first AeroCool device failed hard. I had to modified my fan wires for its stupid connectors and still failed to support solid 25W/Ch in my opinion. My $70 investment plus a few hours of setting up clean wires end up all wasted. Try G-Van or Lamptron units... AeroCool should save the money on USB/Audio ports to better quality control. 1 and up $59.00 ea.